"It's not shocking considering the changes in journalism," said Michael Musto, who started at the Voice in the '80s. "It is a loss." 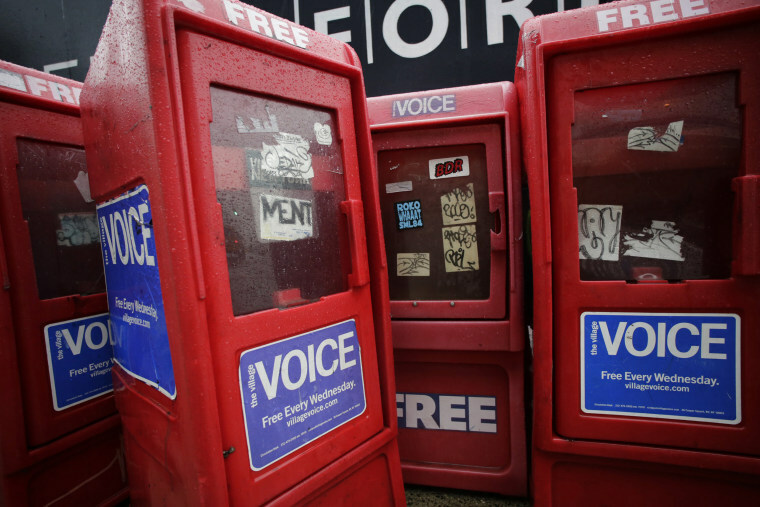 The Village Voice, the famous New York-based alternative newspaper, has published its final story, according to its owner. The online destination will lay off half of its remaining staff of about 20 and will cease publishing on the web, a year after it stopped its print edition, the Wall Street Journal reported. The newspaper chronicled the city's arts, culture and politics for generations and made bylines such as Michael Musto household names. Peter Barbey, the Village Voice's owner and an heir to a retail fortune, said he couldn't continue to keep the publication in business. "Today is kind of a sucky day. Due to, basically, business realities, we're going to stop publishing Village Voice new material," Barbey told staff, according to Gothamist, a website about New York. Barbey was not immediately reachable for comment. He released a statement about the closure to news outlets, reading, in part: "In recent years, the Voice has been subject to the increasingly harsh economic realties facing those creating journalism and written media. Like many others in publishing, we were continually optimistic that relief was around the next corner. Where stability for our business is, we do not know yet. The only thing that is clear now is that we have not reached that destination." The Village Voice began publishing in 1955 and was once found in plastic distribution boxes every few blocks in Manhattan. But the rise of internet news and the growth of social media gave everyone with an opinion a voice, and the tabloid newspaper foundered. Musto, who started at the Voice in the '80s, said in an interview that people used to wait on street corners for the weekly to arrive. "It's not shocking considering the changes in journalism," he said. "It is a loss. The Voice meant everything to me, and I found my voice there." Musto ran a column called "La Dolce Musto," after the Italian movie, "La Dolce Vita," about the life of a gossip columnist. "It was at the heart of the fabulosity of New York nightlife and cultural events. I was able to elevate drag queens and performance artists way before that was a cool thing to do," he said. He said he was one of a handful of openly gay writers who were able to rally against homophobia. Musto tweeted, "I hope it gets sold and stays alive." The Voice had ended print production and switched to online-only in an attempt to stay in business, but that course of action has not often saved struggling publications. "Digital has not proven to be the heaven for dying print magazines," said Samir Husni, director of the Magazine Innovation Center at the University of Mississippi. "It's more like intensive care." Husni believes Time Out New York's decision to distribute free magazine copies contributed to the Village Voice's demise. Even so, Husni does not rule out a come back for the alt weekly. "I've learned over the 35 years of my career that nothing is ever gone or finished," Husni said. "Look at Interview. I don't think we've seen the end of the Village Voice."